It strikes me as one of life’s great mysteries that Cillian Murphy, star of 28 Days Later, Nolan’s Dark Knight trilogy, Sunshine, and the BBC’s excellent Peaky Blinders, doesn’t command the same sort of seat-grabbing frenzy for his rare stage appearances that peers such as Benedict Cumberbatch and Tom Hiddleston do. But selfishly, I’m pleased about that as it means I have had the privilege of witnessing not one but two of his collaborations with playwright Enda Walsh. Murphy’s solo performance in Misterman knocked David Tennant’s Katurian in The Pillowman off the podium to become my favourite theatre performance of all time, and he is no less mesmerizing in Ballyturk. If anything, the latter is even more physically and emotionally demanding than its predecessor, but Murphy throws himself into the role with a fearlessness and nakedness (almost literally) which makes it impossible to take your eyes off him, even for a second. In Ballyturk, he deploys his full arsenal as Number One, lurching between manic, perfectly poised physical comedy sequences, explosive acts of violence, and moments of heartbreaking fragility. As in Misterman, Murphy inhabits every inch of Jamie Vartan’s fantastic set, using both his striking appearance (those blue eyes are hypnotic, icy beacons, even from the back of the auditorium) and a range of vocal acrobatics. He mimics, whispers, shouts, wails and hiccups his way through his lines, even howling eerily into an effects-laden microphone in a scene which simultaneously had every hair on my body standing to attention and made me wish he fronted a rock band. He is hands-down one of the most arresting, charismatic, and talented actors working today. No less impressive are his co-stars Mikel Murfi and Stephen Rea as Number Two and Number Three. Murfi contorts his body, at One’s suggestion, into a series of imaginary inhabitants of Ballyturk, the small Irish town that may or may not exist outside the confines of their strange and grim bedsit, with a remarkable deftness. Rea is a still, unsettling counterpoint to the frenetic dynamic between One and Two, and actually had me in tears with his measured, resigned musing on the fleeting and transient nature of life. I am loathe to give away too much about the actual story, such as it is, because I believe Ballyturk is an experience you should come to relatively unspoiled. Suffice to say Walsh takes many of the themes familiar to fans of his previous work and weaves them into a surreal and largely inscrutable tale here. Much of the negative criticism I have read centers around the fact that this play is unfocussed, pointless even, but perhaps that is the point. Stripped of our ability to follow the narrative in a traditional, linear way, we are forced to feel rather than fathom our way through. I laughed, gasped and cried, sometimes all three at once. 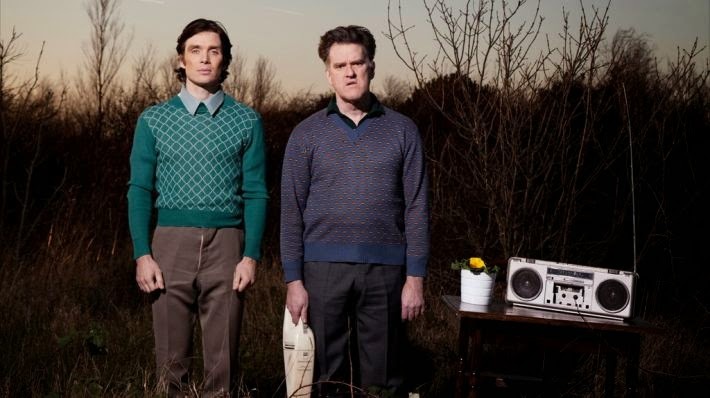 Ballyturk offers glimpses of a world beyond, teasing the audience with crumbs of backstory, place, and time, but just enough to whet the appetite and lead us toward a hundred different possibilities and myriad meanings. Ultimately it’s a meditation on fragmentation, confabulation, memory, connection, loss, and the banality of every day life, which is both frustrating and comforting. The relationship between the two leads is the glue, mysterious and indefinable, by turns antagonistic and achingly tender. When the walls of the Purgatorial little world One and Two have constructed literally fall away, everything they have conditioned themselves to be to one another is broken down, and they are left with the only certainty there is – death, and all the reflection, pain and relief that it brings. Walsh’s writing is absolutely beautiful. Poetic and lush, he segues seamlessly from ludicrous mutterings from beyond the walls, into hilarious and pointed exchanges in the village shop, into poignant monologues on the human condition. It could be argued that the tonal shifts throughout the piece reflect the nature of life itself. I certainly felt I’d run the full emotional gamut by the end of ninety breathless minutes, as my panda eyes could attest. So what is Ballyturk? Beckett via Bottom? Waiting for Godot via Jedward? Father Ted via Faust? Under Milk Wood via Dante? There are no real answers, only a million leading questions, and that’s what makes Walsh’s latest work so haunting. See it while you can. This entry was posted in Uncategorized and tagged ballyturk, cillian murphy, drama, enda walsh, irish, mikel murfi, misterman, review, stephen rea, theatre. Bookmark the permalink.